Carpinteria might just be the last great little beach town in California, with the World’s Safest Beach. Take the Linden Avenue offramp, exit 86A. Exit right. Sly’s is on the left hand side, two blocks up at the corner of Linden & Seventh. Take the Casitas Pass Road offramp, Exit 86. Turn left at the stop sign, and go over the freeway. 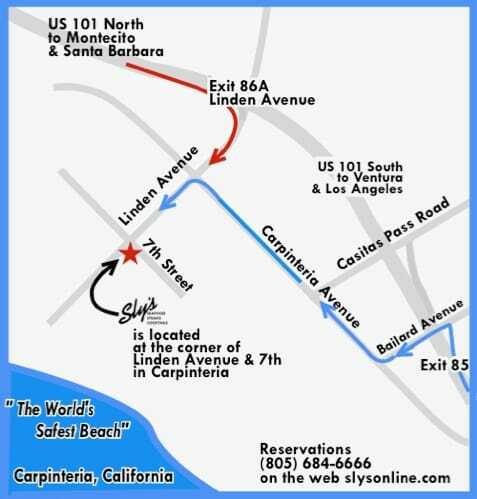 At the light, Carpinteria Avenue, turn right. Continue 4 blocks to the next traffic light, Linden Avenue. Turn left. Here are the directions from Google, so you can plot your own approach to Sly’s. From Goleta, Santa Barbara or Ventura, it’s a quick and simple Amtrak ride on the train to the station in Carpinteria. The train schedule works quite well for dinner and for brunch! And those Ramos Fizzes, Bloody Marys, and Mimosas won’t get you in trouble.